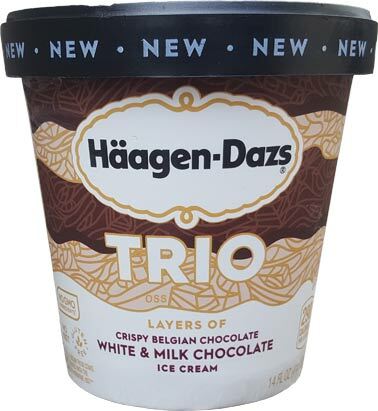 [New for 2017] Easily one of the most fascinating ice cream advancements coming out this year is the new Trio line up from Haagan-Dazs. Billed as multiple layers of ice cream and chocolate, how can you not be excited? Maybe you don't like H-D? Nahh, that can't be it! It looks like a plain vanilla and chocolate swirl ice cream to start. 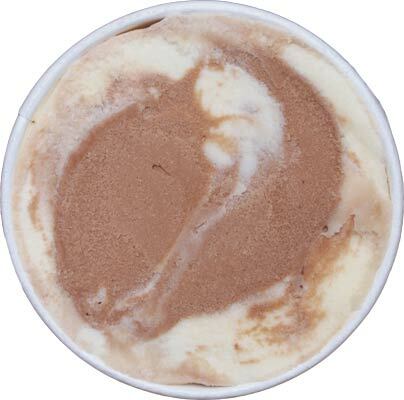 The tricky thing about a white chocolate ice cream swirl like this is that you'll probably never truly get it separated from the milk chocolate ice cream swirl to verify it's flavor. However, I can tell you it's sweet and reminiscent of white chocolate. Now where is the chocolate layer? Ooo, I see little chocolate bits on the edges. --crunch-- yup, that's them! 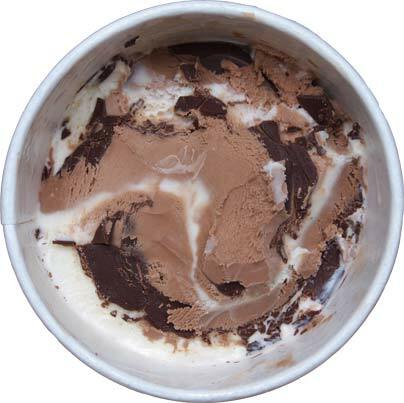 You can actually hear the thin chocolate layer break apart as you push your spoon into it. Very cool. Ohhh, I see a second layer too. I dig in and proceed to enjoy over the next several minutes. 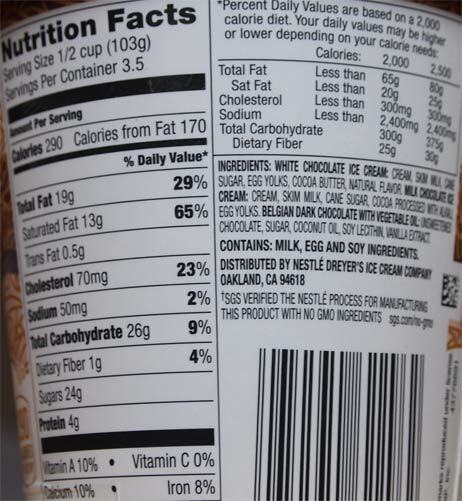 Obviously the Haagen-Dazs quality is here, it always is, but I'm debating how I feel about the overall flavor profile. Don't get me wrong, I like it, I do, but when you enter new territory like this, I think there is an adjustment period. 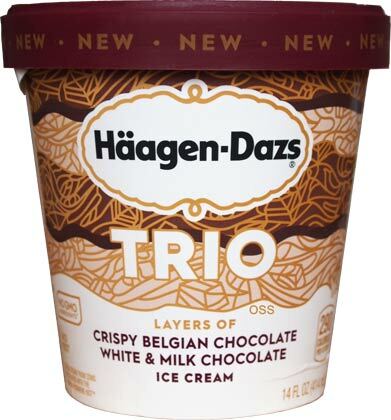 What I'm trying to adjust to (or question) is the flavor profile of this triple chocolate setup. In particular is the use of the white chocolate ice cream. Rather than getting a traditional chocolate flavoring infused with real chocolate layers, we instead diffuse the overall chocolate flavoring of this treat with the white chocolate ice cream. I guess I'm just not sure how it plays against the chocolate layers. Sometimes it feels like a distraction instead of a harmonization. I'm talking in circles again, aren't I? Look, this is a neat product, I won't argue that. This is some very fun ice cream tech on display and no one can take that away from H-D. At a bare minimum, you need to pick up at least one trio flavor and give it a shot. That said, we'll see how all four flavors earn my appreciation over time. On Second Scoop: So they must have a special nozzle that squirts out the two ice creams and the chocolate all at the same time and then swirl that in to the faux pint container as they fill it. On this second sampling, I scooped along that swirl divide to get the Belgian chocolate to come out a little more and I think it helped. To clarify, this is a tasty ice cream and you will enjoy it to a good degree no matter what. 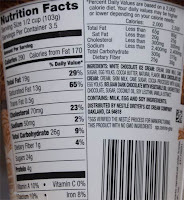 The thing I was trying to bring up earlier is that I think I expected the actual chocolate to be more of a factor. When you eat a magnum bar, there's always that chocolatey coating on your tastebuds and part of me thought that same underlying chocolatey vibe might stick here but the chocolate just isn't thick enough for that. I hope all this makes sense. Go ahead and buy a pint to try it for yourself and then come on back to let us know what you think. Original packaging that didn't last very long. I'm especially excited about the white chocolate ice cream component. Such an underrated ice cream flavor/base. I actually thought that the dark chocolate pieces in the White Chocolate Raspberry Truffle flavor completely overpower the white chocolate base - I was disappointed. The BEST white chocolate ice cream out there is the Swiss White Chocolate flavor from Mitchell's (based in Ohio). I did a review if you'd like to see a photo (not trying to promote, just trying to share my opinion of the rare but perfectly executed high quality white chocolate ice cream). I love the chocolate layer. This flavor is good. I think I like the caramel version a little more. I can't wait to find the blackberry. Just had this last night! Really enjoyed it. Please review the other flavors asap. i was super excited to try this pint tonight but then was really disappointed when I actually dug in. Really excited to try this one as I'm not a huge chocolate person so I feel like the mixture of white chocolate with the other two will help tone the flavour down in a nice way. I picked up the lemon raspberry one earlier and I'm about to try it. Really looking forward to hearing your opinion on it! I wonder if any others who had this felt like I did - as if I were eating old-school Viennetta but in pint form. A very nice ice cream. My only critique is that the cream doesn't seem to stand up too well to the bolder flavor of the hard chocolate swirl.